I really can't get enough of Northern part of Thailand, my favorite holiday destination from all regions. This family trip is taken around new year break. Visiting main area like Chiang Rai, Chiang Mai and Mae Hong Son. First stop after a long drive last night was this Bhumibol Dam in Amphoe Sam Ngao district of Tak Province. 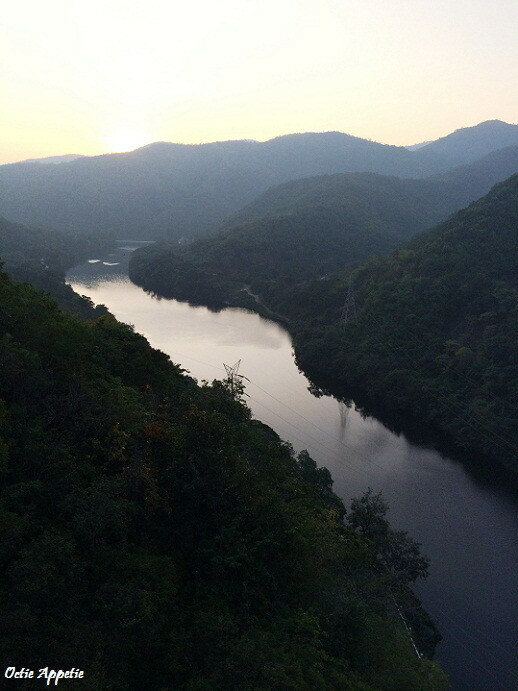 This dam is named after Thailand's King and is a beautiful arch dam on the ping river. Then not far from there, there is a small local morning market, selling homey food, fresh fruit and vegetables. Next stop and a must visit is this Wat Rong Khun. It is like a white temple, painted in white and stick in pieces of glass that sparkling in the sun. This temple is designed by a famous Thai artist, Chalermchai Kositpipat. He had ever dreamed about heaven and then build this temple accordingly. However, this temple is not finished yet, eventually there will be nine buildings in total. So far for me, this temple is the most beautiful looking temple with white color and shining glasses, simply like heaven even I haven't seen one.